Bend, OR (February 1, 2019) – Hydro Flask, an award-winning leader in high-performance, insulated stainless steel flasks and soft good innovations, a Helen of Troy Limited (NASDAQ, NM: HELE) company, is excited to announce the launch of its redesigned Coffee collection, featuring the leakproof Flex Sip™ lid. The new product line also extends across the urban-inspired Skyline Series collection, alongside the 12 oz Coffee Mug. Additionally, Hydro Flask is expanding its drinkware offerings with the release of the 16 oz Tumbler. The Flex Sip Coffee collection pairs Hydro Flask’s popular Flex Strap with an all-new, leak-proof lid design that twists to unlock the Smooth Flow Opening for worry-free sipping, creating the best on-the-go coffee experience. Proprietary Honeycomb Insulation™ works in tandem with Hydro Flask’s TempShield® double wall insulation to help keep your favorite beverage hot for up to 6 hours or cold for up to 24. Compatible with all Wide Mouth Bottles, the Flex Sip lid features stainless steel pivots and an easy-to-carry flexible strap for comfort while on the move. The Flex Sip Coffee collection includes a modern, streamlined bottle design available in the standard coffee shop sizes of 12 oz, 16 oz and 20 oz. Durable 18/8 professional-grade stainless steel resists condensation, prevents breakage and protects against heat and light. Each of the new Flex Sip Coffee products will be available in seven colors and will retail at manufacturer’s suggested retail prices of $29.95, $32.95 and $34.95, respectively. The 16 oz Flex Sip Coffee and 12 oz Coffee Mug will also be available as part of the Skyline Series, a modern design collection of Hydro Flask customer favorites inspired by urban lifestyles and landscapes. Subtle, streamlined aesthetics pair a subdued tonal logo with six fresh colorways: Brick, Sky, Black, White, Mist and Stone. Spanning multiple product categories, the full line of Skyline Series products include the 16 oz Flex Sip Coffee, 12 oz Coffee Mug, 15 L Unbound Series® Soft Cooler Pack and Tote, small Tag Along™ bottle sling, 25 oz Wine Bottle, 10 oz Wine Tumbler, and the 18 oz and 21 oz Standard Mouth bottles. The curated line ranges in manufacturer’s suggested retail pricing between $29.95 and $224.95. The Skyline Series is available in select cities only and online at www.HydroFlask.com. Hydro Flask further expands its drinkware collection with the release of the 16 oz Tumbler. Made durable with TempShield double wall vacuum insulation and pro-grade stainless steel construction, the new Tumbler ensures whatever you’re sipping stays icy cold for up to 24 hours, from morning smoothies to your favorite craft beer. Hot liquids stay hot up to 6 hours. The splash-proof lid means worry-free transport, with built-in Honeycomb Insulation for additional temperature control, while the Tumbler’s streamlined design offers a comfortable one-handed hold. The 16 oz Tumbler will be available for a manufacturer’s suggested retail price of $27.95. Dedicated to uniquely refreshing experiences, innovative design and an unparalleled user experience, Hydro Flask continues to receive accolades for its insulated products. 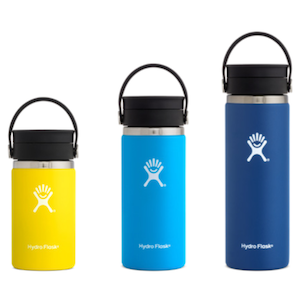 Hydro Flask has been the recipient of several Red Dot, GOOD DESIGN™ and iF Design Awards. The company has grown to become the number one overall American water bottle brand in Sporting Goods and Outdoor, according to Sports One Source SSI reporting. Visit Hydro Flask at Outdoor Retailer Snow Show at booth #51087 UL. Hydro Flask is the award-winning leader in high-performance insulated products ranging from beverage and food flasks to the new Unbound Series soft coolers. Inspiring an active and joyful on-the-go lifestyle, Hydro Flask innovations showcase TempShield double-wall vacuum insulation to lock in temperature, 18/8 pro-grade stainless steel ensuring pure taste and durable, ergonomic design for the ultimate trusted sidekick. Founded in 2009 in Bend, Oregon, Hydro Flask is committed to making tomorrow better – from using BPA-free, recyclable materials to its charitable giving program Parks For All, which supports the development, maintenance and accessibility of public green spaces so people everywhere can live healthier, happier and more fulfilled lives. Learn more about Hydro Flask, Parks for All, and our mission to save the world from lukewarm at www.hydroflask.com. Helen of Troy Limited is a leading global consumer products company offering creative solutions for its customers through a strong portfolio of well-recognized and widely-trusted brands, including OXO, Hydro Flask, Vicks, Braun, Honeywell, PUR, and Hot Tools. All trademarks herein belong to Helen of Troy Limited (or its affiliates) and/or are used under license from their respective licensors. For more information about Helen of Troy, please visit www.helenoftroy.com.